Art historian, scholar, writer and curator Steve Loft doesn’t mince words when he talks about the need for an art exhibition like Ghost Dance. 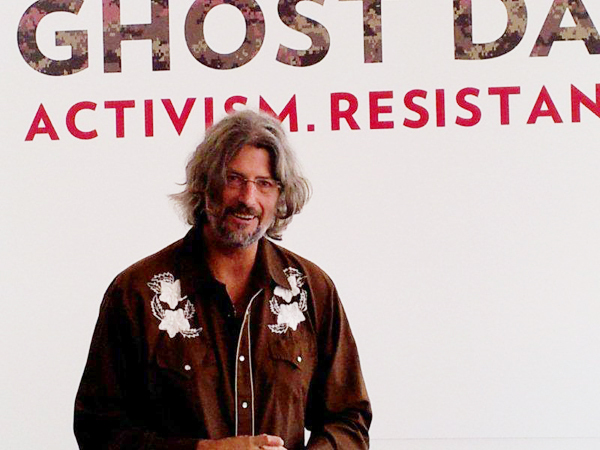 Ghost Dance: Activism. Resistance. Art. is currently on show at Toronto’s Ryerson University Image Centre. Loft, who is of Mohawk and Jewish ancestry, has been the National Visiting Trudeau Fellow at Ryerson for the past three years. Ghost Dance is part of a larger work of research that he’s done at Ryerson, looking at Indigenous art history as its own art history. Loft has brought together contemporary artworks from nine artists: Vernon Ah Kee, Sonny Assu, Scott Benesiinaabandan, Dana Claxton, Cheryl L’Hirondelle, Alan Michelson, Theo Sims, Skawennatti and Jackson 2Bears. Also included in the exhibition is a poem by artist Leonard Peltier who has been imprisoned by the U.S. for more than 35 years. Loft has interspersed photographs from Ryerson’s Black Star collection, the images depicting Indigenous struggles, including the occupation of Alcatraz and Wounded Knee. 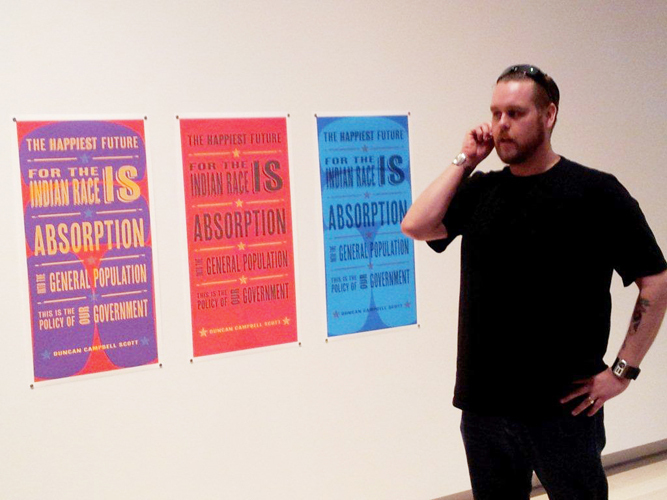 This is a thought-provoking exhibition. Mohawk artist Alan Michelson’s video installation with sound pays homage to the round dance, a dance that has become synonymous with the Idle No More movement. It’s an inclusive dance and the dancers are young and old, Aboriginal and non-Aboriginal. The exhilaration on the dancers’ faces informs the viewer that resistance through cultural expression is not just joyous, but it feeds the spirit. Sonny Assu, Ligwilda’xw of the We Wai Kai First Nation has three pieces in the exhibition. Leila’s Desk is in remembrance of his grandmother’s story. Up until the early 1940s, it was illegal under the Indian Act for status Indians to go to high school. Assu’s grandmother was one of the first Indigenous people to be allowed to go to high school. One can imagine how full of excitement she must have been on her first day only to be confronted with a bar of soap on her desk and the perpetrator laughing with his friends. Assu said his grandmother, who is now in her eighties, remembers the incident well and tells it often, sometimes with tears and sometimes with anger. The desk is a reclaimed 1930s school desk restored by Assu who copper-leafed the cast iron legs. The bar of soap? He sourced 1930s Lifebuoy soap, the brand his grandmother remembers lying on her desk. All of the pieces in Ghost Dance are equally powerful and some are very haunting, but all will evoke a reaction as they engage the viewer. Ghost Dance is on view at Ryerson Image Centre, 33 Gould Street in Toronto until December 15, 2013.